‘The travesty of democracy that has enveloped the Trans-Pacific Partnership Agreement (TPPA) from day one continued with a pathetic report released by the Foreign Affairs Defence and Trade committee yesterday’, says University of Auckland law professor Jane Kelsey. Professor Kelsey described the select committee process as ‘a total farce’. The report was written while submissions were still being heard, after the government fast forwarded the report date by three weeks. 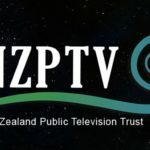 The reasons were never explained, but were likely intended to pressure the Waitangi Tribunal in writing their report on the TPPA, which is now scheduled for release later today. All the opposition parties criticised the secrecy of negotiations and truncated committee process. 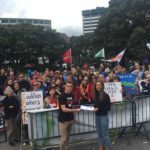 Labour has said they will vote against ratifying the TPPA ‘as it stands’. But their minority report addresses only two narrow issues: foreclosing the right to ban foreign purchasers of residential housing and the economic modelling. Anything that was critical of previous agreements that Labour negotiated was ignored, including investor-state dispute settlement (ISDS), despite clear evidence that is highly problematic. 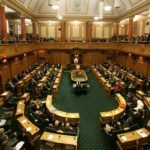 Both the Greens and New Zealand First go deeper, with the Greens proposing some interesting ideas about processes for future agreements. But Professor Kelsey insists that ‘ad hoc changes are not enough. We desperately need an independent inquiry into the treaty-making process that is freed from the overpowering influence of the Ministry of Foreign Affairs and Trade’.